Back in his mountain origin of Bocchigliero, he was a peasant farmer. Like many others, he came to America to pursue a dream– a better life for his family. Because he was pursuing a better life, my grandfather spoke out for better working conditions in the coal mine. He helped build a coal miner’s union. Without modern regulations, laboring in a coal mine in the early-to-mid 20th century wasn’t a fun or healthy way to earn a living. Whenever I was unhappy in my own career, I would think about my grandfather. Although he died before I was born, I always felt his story was a part of my story too. I’d think, “if he could go down into a coal mine everyday, then you can do this.” That helped me put my white-collar employment woes into perspective. Being an American dreamer, my grandfather knew that the ticket to a better life was to work hard and focus his children on education. He sacrificed himself, so that his kids could get educated and make his dream their reality. Even today, health-related disease, like black lung, and mining accidents are real issues for coal miners worldwide. In economics, negative externalities are consequences created by one party (in this case the coal mine) that affect another party (the rest of us) who did not choose to incur that cost. For society, the cost of coal mines include increased asthma rates- especially in children, heart and lung ailments, cancers, acid rain, and most notorious- climate change. Coal is very dense in carbon and also contains methane. When it is burned, it releases both carbon dioxide and methane- two potent greenhouse gases- into the atmosphere. And, this accelerates global climate change. Propping up a fossil industry in decline, creates a stale state where people are perpetually looking down; under-valuing their potential. Someone looking down will never look up long enough to advance their education or upgrade their employment skills in order to join a new economy. Our goal should be to create an inclusive society that allows everyone to thrive. Giving today’s coal miners access to the tools needed to enter the 21st century economy, helps them get good paying clean energy jobs. 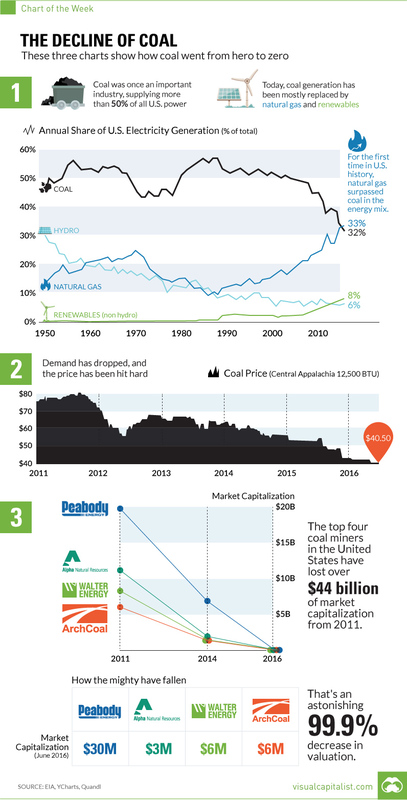 Politicians need to stop using coal miners as pawns to bolster an industry that is near its last death spiral. The quicker we make efforts to move forward, the sooner all can realize their American dreams. I’m sure my grandfather would agree.